In partnership with the government of Myanmar, the 3MDG Fund has supported the establishment of 23 new clinical skills labs in schools through the “Improved Midwifery for Maternal, Newborn and Child Health Services” project. Setsan, Myanmar — Ma Kay Thi Aung will never forget that morning 11 years ago when tragedy struck. Her aunt had endured a long labor, but the baby was not coming. All efforts by the village traditional birth attendant were failing. Her aunt’s condition only worsened. Finally, it was decided to take her to the nearest rural health center in Setsan. Travel from their village in Ayeyarwady Region was not easy with streams crisscrossing the countryside. A 3-hour boat ride, while more feasible, depended on the tides but the family, accompanied by a traditional birth attendant, pushed ahead. While en route, Aung’s aunt gave birth to a stillborn baby and started bleeding uncontrollably. By the time she reached the health center, she had lost too much blood, a life-threatening condition called postpartum hemorrhage. She was referred to a bigger hospital in town, which meant yet another boat ride. Aung’s aunt died before she could reach the hospital. A family tragedy led Ma Kay Thi Aung to chose midwifery as her profession. Her aunt’s death also brought about a sense of purpose for Aung. After high school, she decided to pursue a career in midwifery. “My aunt’s tragedy was still fresh and it haunted me very much,” she said. She enrolled in the 2-year midwifery course at the Nursing and Midwifery Training School in Pathein. 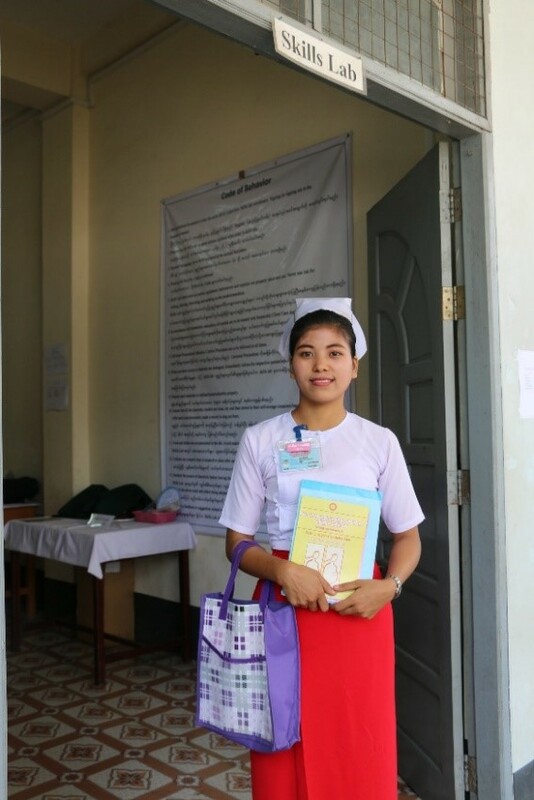 As part of her first-year program, Aung was introduced to innovative and effective teaching methods designed to build confident, skilled midwives through hands-on practice in the school’s clinical skills lab. Across Myanmar, 23 such skills labs have been established in schools through the “Improved Midwifery for Maternal, Newborn and Child Health Services” since 2014. With support from the 3MDG Fund, Jhpiego has worked with the Ministry of Health to strengthen scalable midwifery education and training systems to ensure consistent, competent and safe clinical care for future mothers and newborns. The donors of the 3MDG Fund have demonstrated a longstanding commitment to maternal health in Myanmar, believing that midwives are at the core of a strong, accessible health system. As part of this effort, Jhpiego has trained 68 master mentors and 345 faculty and clinical staff on how to standardize clinical skills and 51 faculty members from nursing and midwifery training schools on how to use the skills lab in practical sessions with their students. A total of 105 faculty members received training to strengthen their teaching skills and conduct competency-based performance assessments. “I have learned how to manage third stage of labor, applying best practices to save mother and babies,” Aung continued. The hands-on practice with anatomic models has helped make Aung confident to deliver with a real woman. Honing her skills at the lab prepared Aung for her second year of field training, during which she assisted with two deliveries at Pathein General Hospital and managed four deliveries as part of a mobile team of midwives in Pathein’s outlying poor neighborhoods. Aung stressed the importance of treating a woman in labor with kindness, respect and tenderness, referring to the respectful maternity care practices she learned through the skills lab. After graduating, Aung intends to apply for a government posting, saying she’d like to work in her own neighborhood or anywhere in the region because Ayeyarwady Region has one of the country’s highest rates of infant and maternal mortality. Midwifery graduates like Aung would indeed be driving forces in strengthening the provision of basic health care as well as upgrading the country’s national health standards.